I first started living history re-enactment along with my father Gary when I was under ten years old, but it was when we moved to the Roman period at about age twelve that I first decided to learn a show-and-tell activity to demonstrate at events. Gaming was the perfect solution – something relevant to all ages which I can still display many years later. The sheer fun of the board games is enthralling to all ages, and as an adult, the intricacies of the associated gambling provide for an interesting parallel with our times. So it was that I commissioned Gary to make the board games shown here, all hand-carved based on known designs. Aside from the element of fun, I have always thought that there are two elements about the Roman games which make them of such interest to re-enactor and public alike. First, they represent leisure time at its most pure, dispelling the myth that our ancestors did naught but fight or work. Second, and most importantly to me, many of the games we understand contain strong similarities to modern equivalents, suggesting the hypothesis that a direct lineage is existent. Consequently, by studying and playing these ancient games we are given a clear link between our lives and the lives of the Romans, and judging by certain evidence of cheating in the gambling world, nothing much has changed. The first Roman games I added to my repertoire were board games such as Latrunculi, Calculi, Tabula and Merrills, along with Anglo-Germanic influences such as the intriguing Halatafl, a possible precursor to draughts/ checkers. Merrills, or Nine-Men’s-Morris, is often argued to be the oldest still-played game in the Western world, with examples cut into Egyptian tiles which at the very latest date back to the Graeco-Roman period, possibly earlier. However, as this game is still well-known, here I would like to mention two others which illustrate some interesting points. The game Latrunculi, or Ludos Latrunculorum in full, is the Game of the Soliders (sometimes said to be the Game of the Mercenaries). In its most common form, it is a simple game with few rules, but one which requires a sound strategic mind to play. A number of variations upon board and pieces have been found in both archaeological and historical sources, leading to at least three plausible suggestions as to rules by different gaming historians. ing the warriors Ajax and Achilles playing during the siege of Troy. Given the extent of Mediterranean trade, it is highly possible that a direct lineage exists between these games, which it has been conjectured continues forwards to games like the Viking Hnefatafl and even Chess. Why was Latrunculi so popular? Well, to anybody who’s played it, the answer is obvious: it is a highly engaging game that is both challenging and simple, fast-paced but contemplative. Like modern chess, it’s all in the strategy: both in devising your own and trying to guess at your opponent’s. For the standard version, often played on a board of 8x8 squares, the rules have been reconstructed as follows. 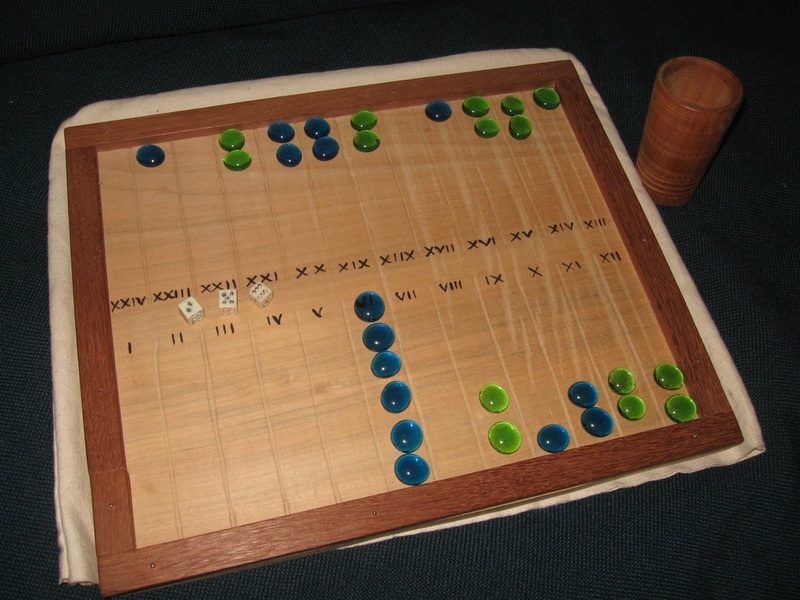 Each player possesses a number of counters – examples rife in materials such as clay, glass, bone and stone – usually 8 or 16, which are set out in rows at opposite ends of the board. Players take it in turns, moving only one counter each turn either horizontally or vertically any number of squares. As Latrunculi is the Game of the Mercenaries, the object is to win the ‘battle’, presumably by removing your opponent’s pieces from the board. To take a piece, it is conjectured that, as with the Viking Hnefatafl, it is required to flank them upon two sides. A second interesting variant of the game has been found, which utilises a larger piece in addition to the standard rank-and-file. This perhaps represents the Aquila – the eagle standard which carried such symbolic importance to the men who served under it. 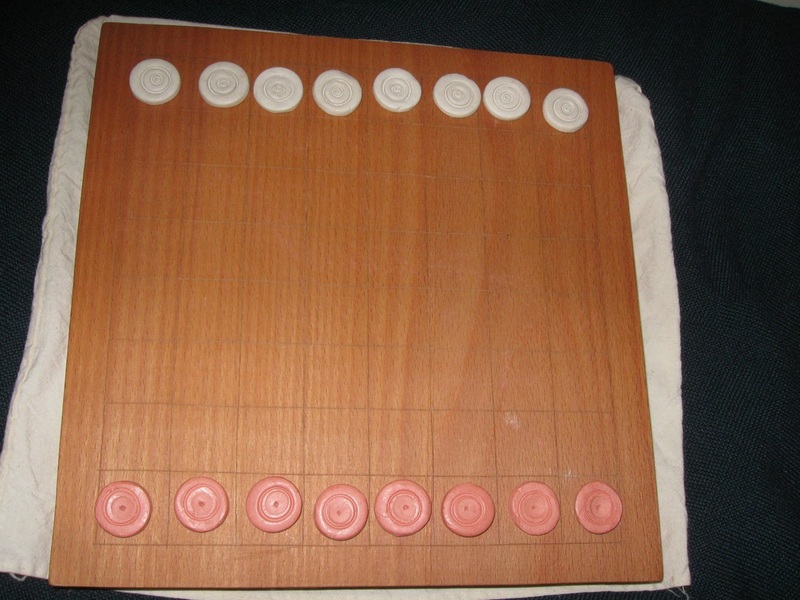 In this version, which begins to look more similar to Hnefatafl, possibly an alternative way to win is to capture the eagle by surrounding it on four sides. Whilst Latrunculi is often a relatively short game, Tabula is anything but. The longest game I’ve ever played lasted over two hours. Based upon the popular chariot races, it is a game of luck, endurance and judgement. With striking similarities to the Egyptian Senet, it is again hypothesised that Tabula is one link in a longer lineage which continues to this day with backgammon, played on a near-identical board. Tabula itself refers to a game which changed across the Roman period: the version I play is based upon some of the later examples. Perhaps the most famous fan of Tabula was the Eastern/Byzantine Emperor Zeno, of whom an epigram was written describing how Zeno’s fortunes were drastically altered by a single dice throw, the detail of which has enabled a viable reconstruction of the rules of the game, such as by suggesting that moving is obligatory, even when it forces you into a much disadvantaged position. Thanks to Zeno’s bad luck, we know that Tabula was played on a backgammon-style board of 24 places in a race-track layout, by two players each having fifteen pieces and utilising three die. The object of the game is simply, obeying the roll of the die, to place all fifteen of your chariots onto the board, before racing them all round the track and to the finish. The pitfall encountered by Zeno lies in your opponent’s ability to remove your pieces from the board and send them back to the start if they are alone in occupying a place (conjuring up images of the dangerous racing from Ben Hur!). Zeno had positioned his counters so that many were grouped and therefore ‘safe’, but the luck of the die forced him to separate them out, leaving his opponent with a perfect opportunity to turn the tide. Perhaps it is this which makes Tabula so enthralling – the way in which simple chance can overturn any amount of strategy or judgement: an element less present in the likes of Latrunculi. An earlier variant of this game, the Duodecim Scripta, was said to be the favourite game of the Emperor Claudius. These are just two of the many board games played by the Romans, but together they illustrate well why this is such an interesting aspect of history. With possible, even plausible links to modern descendants still popular today, and containing elements of skill and luck common to almost all games played throughout the ages, as well as peculiarly Roman references such as the chariot race influence upon Tabula, playing these games is, to my mind, living history in its purest form.